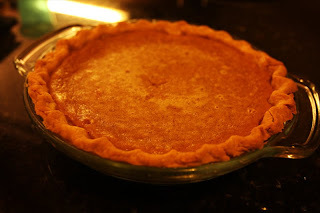 My pumpkin pie recipe (oddly, like many of my recipes) came together by accident. 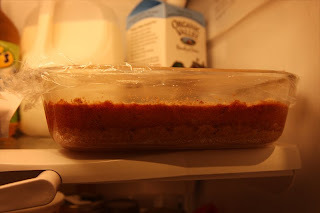 I was trying to follow a simple recipe for pumpkin pie, but I misread and messed up the spices, I dumped in a can of sweetened milk instead of evaporated milk...but the pie was a hit. Give it a try with your fresh pumpkin in your favorite pie crust. Beat your eggs in a stand mixer. Beat in the pumpkin, sugar, spices and sweetened milk. Pour the mixture into a standard, 9-inch unbaked pie shell. 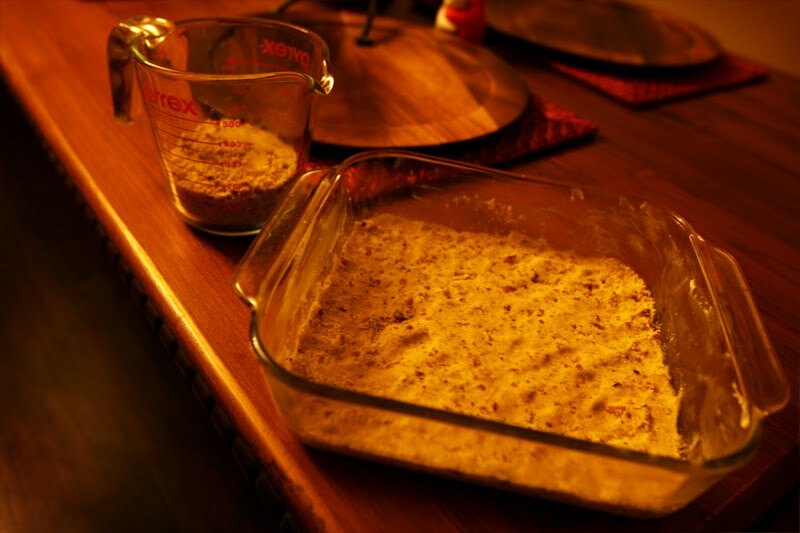 In a food processor, pulse together the flour and brown sugar to combine, then cut in the butter. Pour the mixture into a bowl and stir in the pecans. 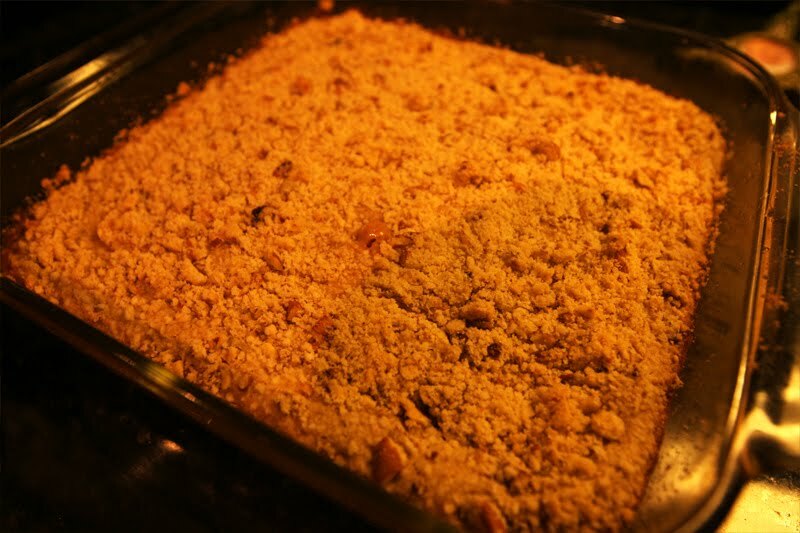 Pull out 3/4 cup of the mixture to use as a crumble top later and press the rest into a well-greased 8" or 9" square baking dish. Bake the crust at 350 degrees for 15 minutes, then remove, set aside and cool. Beat together the cream cheese and sugar until smooth. Beat in the pumpkin and eggs, followed by the vanilla and spices. 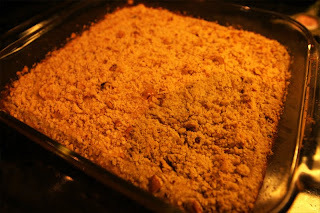 Pour the mixture over the crust and sprinkle the reserved crumble over the top. Bake at 350 degrees for 35 minutes. Let the bars chill overnight in the refrigerator. Since this is turkey week, I thought it would be appropriate to talk about a sauce that's made to go with poultry. 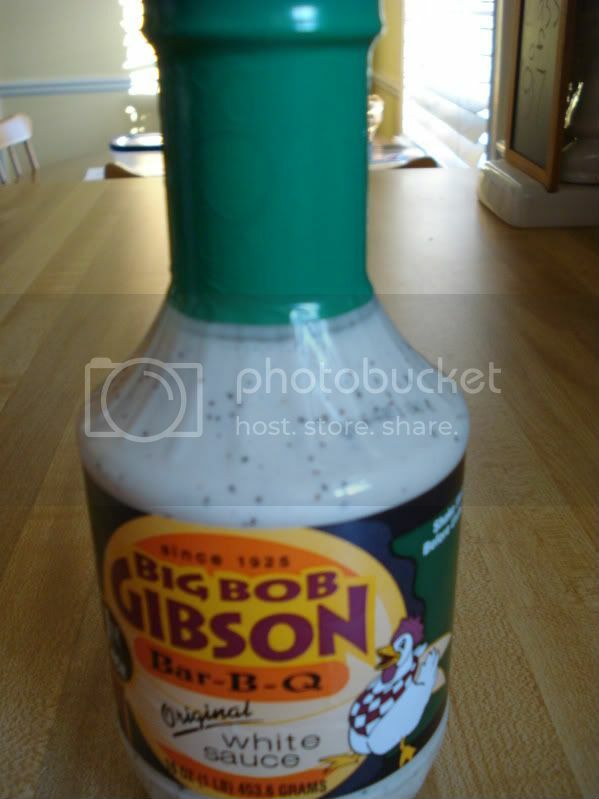 One of Big Bob Gibson's specialties is barbecue chicken with a special white barbecue sauce. It's a North Alabama favorite. You might like this sauce and you might not, but you will definitely agree that it's like no other. When uncapped, the aroma bears a striking resemblance to that of Miracle Whip. And while it's definitely related to Miracle Whip in that they're both in the Mayonnaise family, this white sauce is more tangy than sweet. It's got a significant vinegar component that will pucker you up if you're not ready for it. The vinegar also gives it a thinner consistency - it's got about the same consistency as a thin salad dressing. As you can see in the photograph, there is a fair amount of bits hanging around in the sauce - mostly pepper. The bits tend to settle at the bottom, so you want to give it a good shake before you pour. Since this sauce is so specific to a certain type of protein, I think that you really have to try it on chicken to properly evaluate it. But I like what I taste when I taste it plain - very unique and very flavorful. 1. 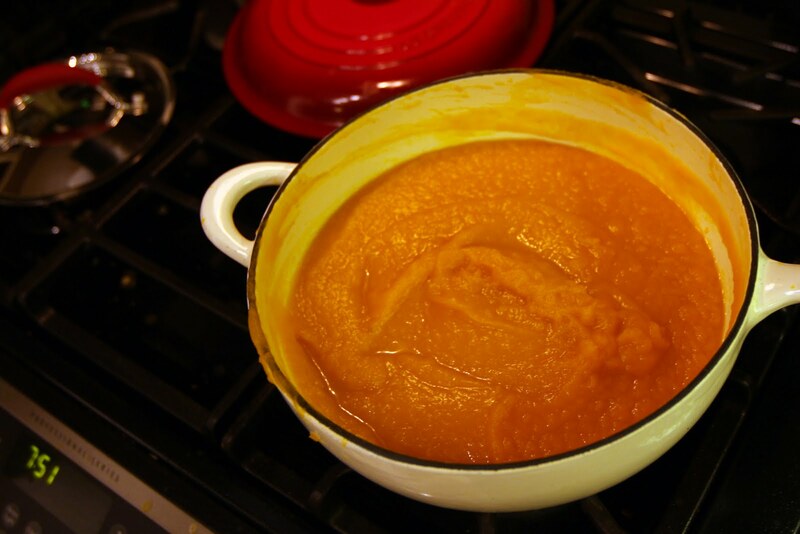 Over medium-high heat, warm the pumpkin mush and butter. 2. Stir in the prosciutto and 1 to 2 tablespoons of finely chopped fresh sage. Cook for a few minutes as you keep stirring. 3. Reduce the heat to low and add the heavy cream and parmesan. Add salt and pepper to taste. Cook and stir until the filling is reduced to about half of the original amount. 4. Remove from the heat and stir in the ricotta cheese and nutmeg. Set the mixture aside to cool. 5. When cool, you can use the filling in your favorite pasta or use wonton wrappers. 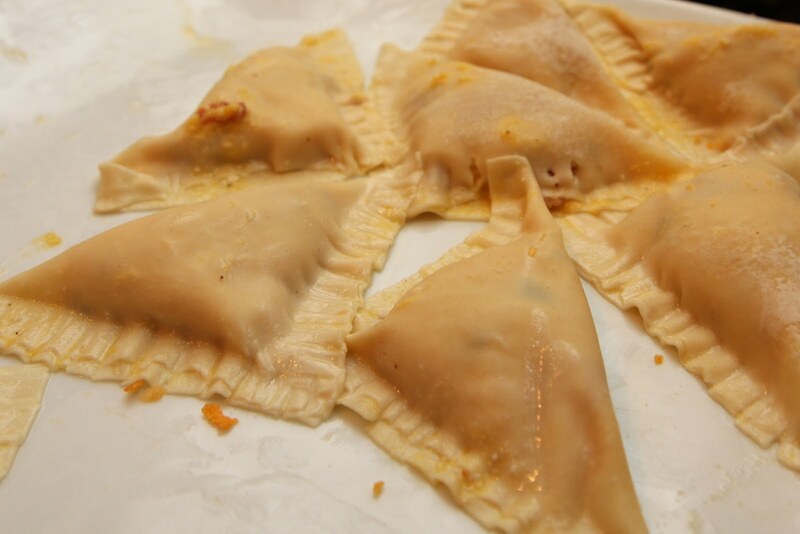 We used square wonton wrappers and folded them into triangles, sealing the edges with water. To cook, drop the raviolis into boiling water and cook for just a few minutes until they float. For the sauce, I used a recipe by my friend Mario. While your pasta cooks, melt butter in a 12 to 14-inch saute pan and continue cooking until golden brown color ("noisette") appears in the thinnest liquid of the butter. Add sage leaves and remove from heat. Add lemon juice and set aside. Drain the pasta, but leaving some cooking water, and gently pour into saute pan and return to heat. Add the cheese, toss to coat and serve immediately. ** I didn't use the lemon (because I forgot to buy it) and I used regular parmesan cheese. Now we're going to start cooking with the pumpkin, and first we have to make the pumpkin mush. 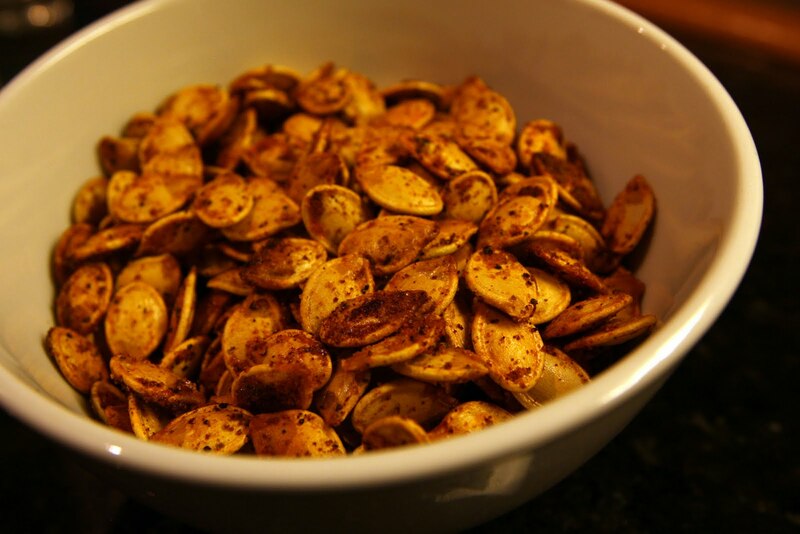 With all of the seeds and stringy insides scooped out, slice the pumpkin into small (6 to 8 inch) sections. 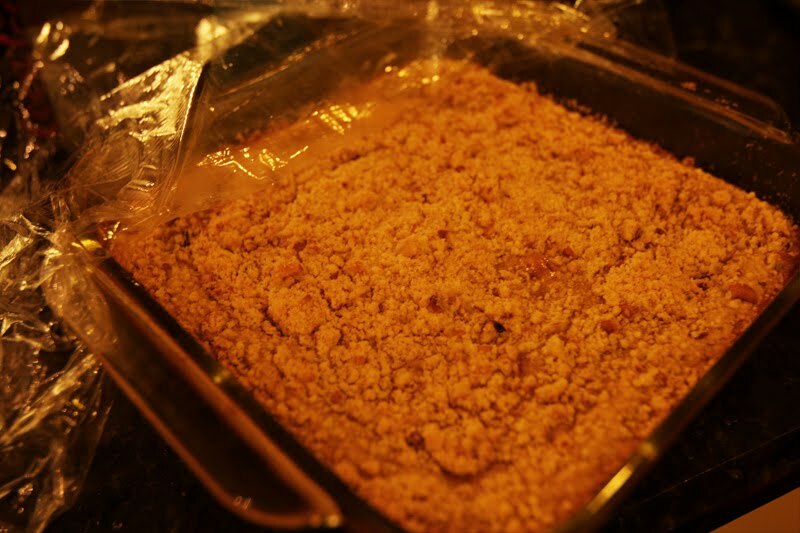 Rub the insides with melted butter and place the pumpkin pieces face down (skin side up) on baking sheets. Bake at 350 degrees F for about an hour. Lots of juices will run out - and since I didn't put anything under my baking sheet, I got to clean out my oven the next day. When the pumpkin is cool enough to handle, peel off the skin and place the pieces in a food processor. A few pulses will turn it to mush. Depending on how liquidy the mush is, you may want to cook some of the water out of it until it has a thicker consistency. Store your pumpkin mush in an airtight container in the refrigerator and freeze any that you don't use within a week. The mess factor is pretty high here, so I didn't take many pictures during the process. 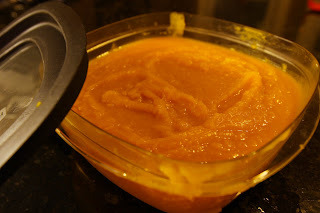 I found a great blog though that has awesome pictures and detailed instructions on cleaning and prepping your pumpkin. I didn't use water and they didn't use butter. If you're gonna skip one, it's gotta be the water. 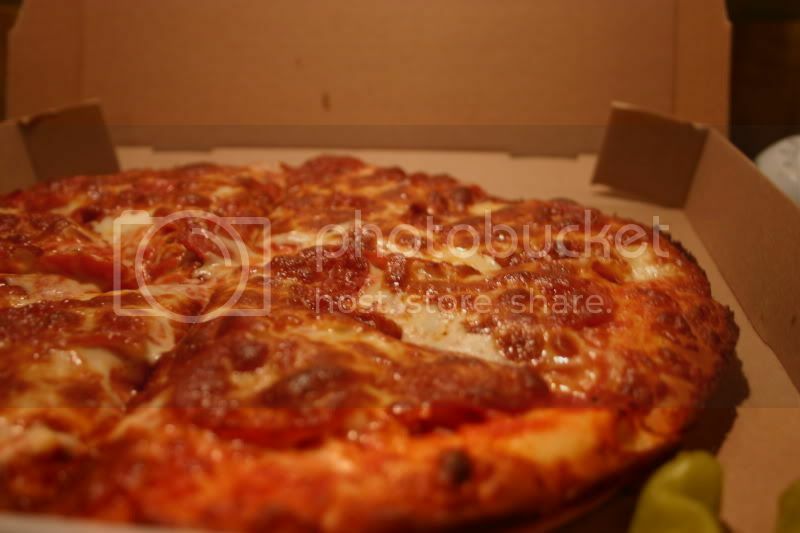 Yes, technically it's an Italian restaurant and not a pizzeria, but they make one of the best pizzas on this side of town, and by far the best one that will deliver to my house. 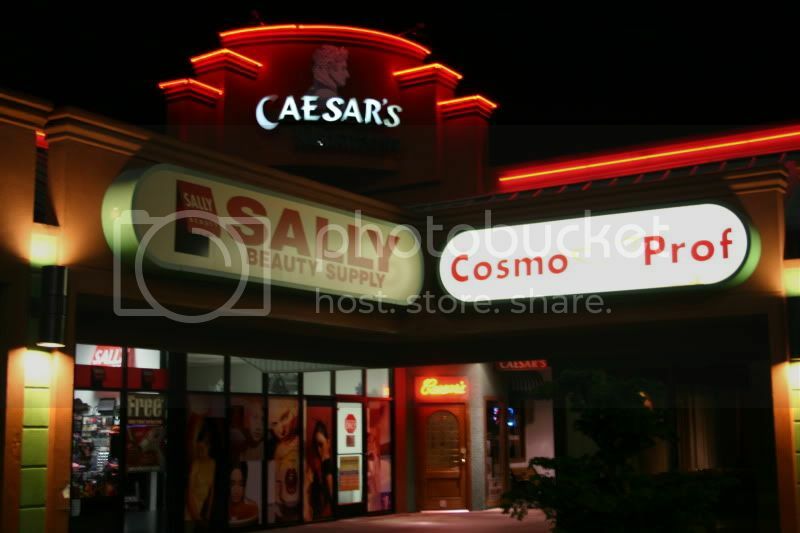 Caesar's is located in the heart of Lion's Head on White Bridge Road. Those of us who've been around awhile will remember that the corner space that Caesar's occupies was once home to Q-Zar. Many birthday parties and Saturday afternoons of fun were had there. And not to brag, but I was pretty dominant in the Q-Zar arena. I had this strategy for scoring at the other team's base that was rock solid. By the way, apparently Q-Zar is still alive and well in other cities, and I have to admit that that makes me more than a little jealous. But I digress. Born in Carini, Palermo, a small city in Sicily, Caesar Randazzo graduated as an engineer. Because of the work shortage, he came to America and worked as a dishwasher and pizza delivery boy for his uncle's pizzeria in Brooklyn, New York. There he worked his way up and learned much about the restaurant business. Caesar migrated to Chattanooga, Tennessee in 1976, and opened five Italian restaurants, only to sell them all seven years later and move back home to Sicily. Caesar spent two years in Sicily before deciding that his future was in the U.S. He returned to Nashville, got lost, and ended up on White Bridge Road. Says Caesar, "I saw the parking lot at Lion's Head full of cars and people standing in a long line. I thought it was Times Square in New York." The people had come to the movie theater, and Caesar noticed that the restaurant space next to the theater was for rent. He contacted the landlord, and three months later opened his Ristorante Italiano. Caesar's serves a full menu of Southern Italian and Sicilian favorites. You can order off of the menu, or they have a lunch buffet Monday through Friday. The place has a certain kitschy Italian charm, and the staff is very laid back and friendly, so it's a fun place to eat. The real appeal for me, however, is their delivery service. They deliver their full menu until...wait for it...4 AM! - seven days a week! That's right - if you have a craving for Veal Saltimbocca at 2:30 AM on a Tuesday, you can get it. Or you could get a pizza. 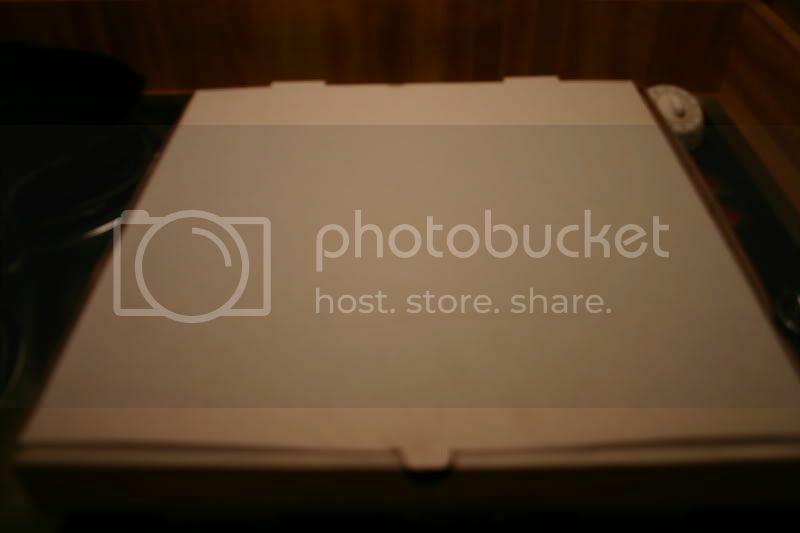 The pizza usually comes in one of those generic "PIZZA" boxes. This time it arrived in a plain white box. They call it a Neopolitan-style pizza, but to me it seems like a New York style pie. It's got that thin, hand-tossed crust and it's very foldable. The crust is fantastic - crisp and chewy on the outside, and soft and warm on the inside. What really makes this pizza great, though, is the sauce. It's got vibrant tomato flavor, with lots of basil and oregano and some red pepper - it's definitely got some zip to it. The cheese is classic mozzarella, and there's plenty of it. Pull-away factor is high. Pepperoni is meaty and spicy. Overall, a very good pizza, in my opinion. I don't think it's quite as good as the Manny's/Joey's gold standard, but I'd definitely put Caesar's among the best pizzas in town. Thank you, MRS, for letting me guest host F.N.S. the last two weeks! It's been fun! Last night, I checked off one more item from the Garden & Gun 100 Southern Foods You Absolutely, Positively Must Try Before You Die. That's right I had a pig ear sandwich. It was a take-out order from all the way down in Jackson, MS. This famous gelatinous sandwich is prepared on a brown and server roll with mustard slaw and some hot sauce. You would think that the texture would be somewhat chewy, but it is actually quite tender. However, it does not have the greatest flavor in the world. The ear its self is not too bad, but the roll and the slaw were not so great. These are the rolls that you would find in the freezer section at your local save-a-lot, and the mustard slaw was a little disappointing. I really think that it might be somewhat of an acquired taste. I also had the Smokes sandwich. This sandwich is ground up sausage that is in a red casing with the mustard slaw and hot sauce. Again I had the same issue with the roll and the slaw, but I still would be willing to try them again hot off the griddle. To be fair, I don't think that a Krystal would be quite as good after it crossed state lines. It is really key to get them right off the cook top. Some day I would like to get the full experience of the Big Apple Inn, and stop in for 3 Smokes and 3 Ears. I had never even heard of a pig ear sandwich until last week when I saw Joe York's short film about the Big Apple Inn, and it was compelling enough to make me want to try one. Watch the video for the full history of the pig ear sandwich. SMOKES & EARS from Joe York on Vimeo. 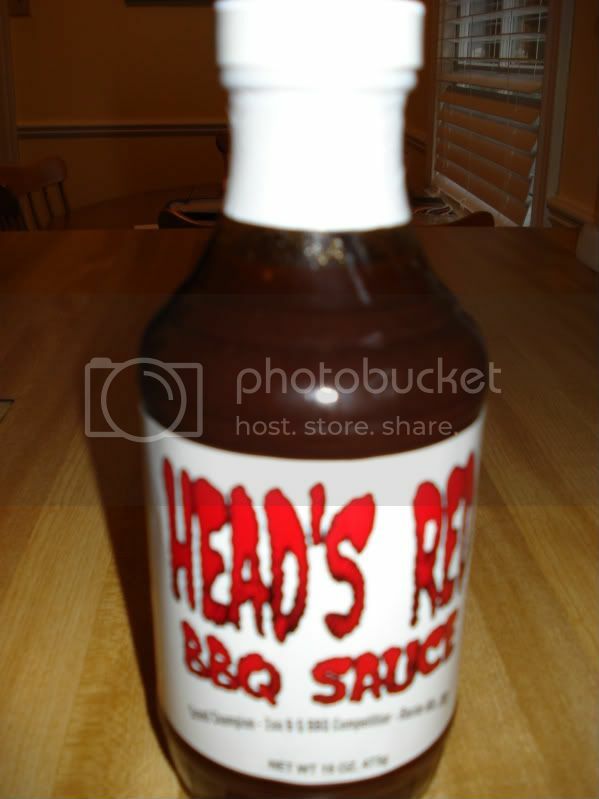 Head's Red is the name of the barbecue sauce, but it's also the name of the competition team of Bill Mehilos, who developed the sauce several years ago, when he couldn't find a commercially available sauce to his liking. Bill's nickname is Head. He's not a redhead. But the sauce is a deep dark red color. It's a thick sauce, and has a complex aroma when you uncap it. It has a relatively smooth consistency, with a few small chunks of onions and such interspersed. The sauce is pretty balanced between the sweet, the tangy, the savory, and the spicy. It's definitely ketchup-based, with bright tomato flavor. The molasses and brown sugar sweetness is tempered by a healthy dose of vinegary tang. The burn that eases in at the end is relatively mild. This is a nice, if unspectacular, all-purpose barbecue sauce, with a balanced flavor profile that will appeal to a lot of people. When will the reign of bacon end? Not anytime soon I guess. Our pumpkin didn't achieve Jack O' Lantern status this year. It sat outside, all alone, for over a week after Halloween. Finally, I decided to bring it inside and see what all I could make with it. 1. 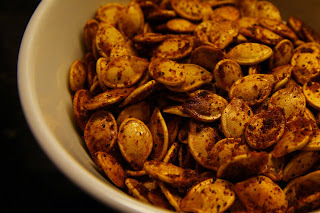 First, scoop out all of the seeds from the inside of your pumpkin. Thoroughly rinse the all of the slimy, stringy stuff off of the seeds (I used a colander). Set the seeds on paper towels to dry. Preheat the oven at 350 degrees F.
Note: I ended up with about 1 1/3 cups of seeds. You may want to adjust the following amounts depending on how many seeds you get. 2. Toss the seeds in 2 tablespoons of melted butter, 1 teaspoon of sea salt, 1 tablespoon of Obie Cue's Double Strength Garlic Pepper, 2 tablespoons of Smoking Guns rub, 1 teaspoon of cayenne pepper and 1 teaspoon of black pepper. Stir until the seeds are evenly coated. 3. Spread the seeds in a single layer on a cookie sheet that has been lightly sprayed with nonstick cooking spray. Bake at 350 degrees for 15 minutes. The seeds are crunchy, salty and bring the heat with the use of the Smoking Guns rub. If you don't have the Smoking Guns and/or Obie Cue's, substitute your favorite barbecue rub and garlic powder or garlic salt. Hey, it's the guest host edition! While The Mrs is tending to some other things, I am going to take the next couple of weeks to tell you about the pizza options in my hood of West Meade. I apologize in advance for the photography, which will not live up to the high standard that The Mrs has established in this series of reports. I guess Michaelangelo's has been around for about 10 years now. It was started by that South African guy who they bring in to talk about soccer on 104.5 The Zone. They started out with a location in Green Hills and a location on Elliston Place. The Green Hills location is no more, but they have replaced it with a location in Belle Meade. There is a website for the Elliston Place location. And another one here. But neither of them mention the other store. Maybe it is under different ownership? The location in Belle Meade, which is the one that I ordered from, is carry-out and delivery only, while the Elliston Place location has a dining room. Like The Mrs, I prefer my pizza with pepperoni and extra cheese. This one is a large, and it was very reasonably priced at about eleven bucks. 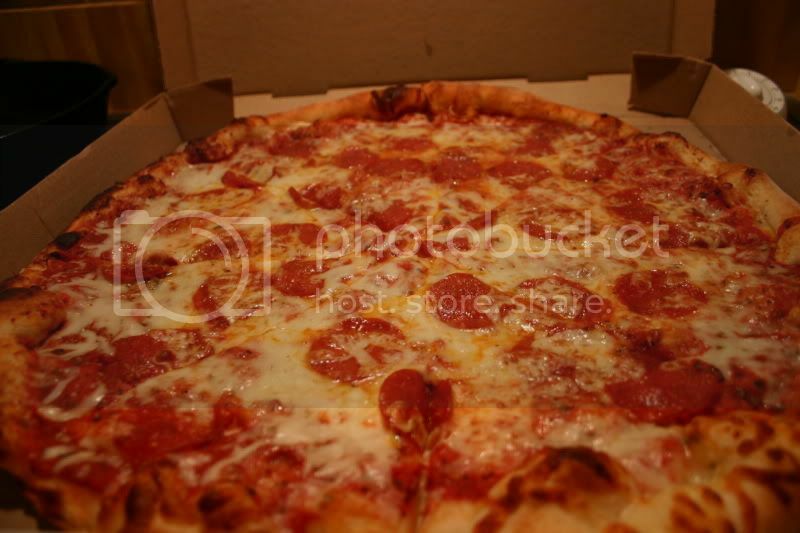 It's an attractive looking pie, with the cheese nicely browned and the edges of the crust nice and crispy. About that cheese - at Michaelangelo's, when you order "extra cheese," you get mozzarella and cheddar. 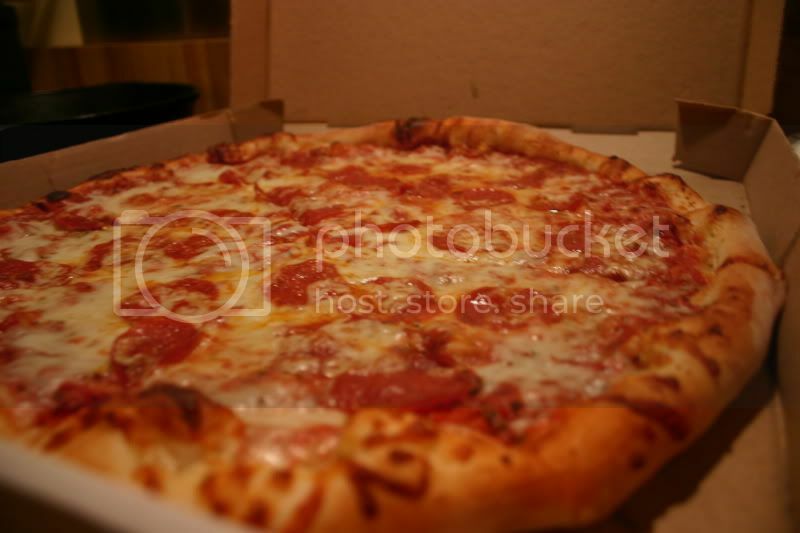 The cheddar definitely gives the pizza unique taste, but it cuts down on the "pull-away factor" significantly, as melted cheddar just does not have the same stretchy, stringy qulaity as mozzarella. The pepperoni slices were of average quality, not especially spicy. 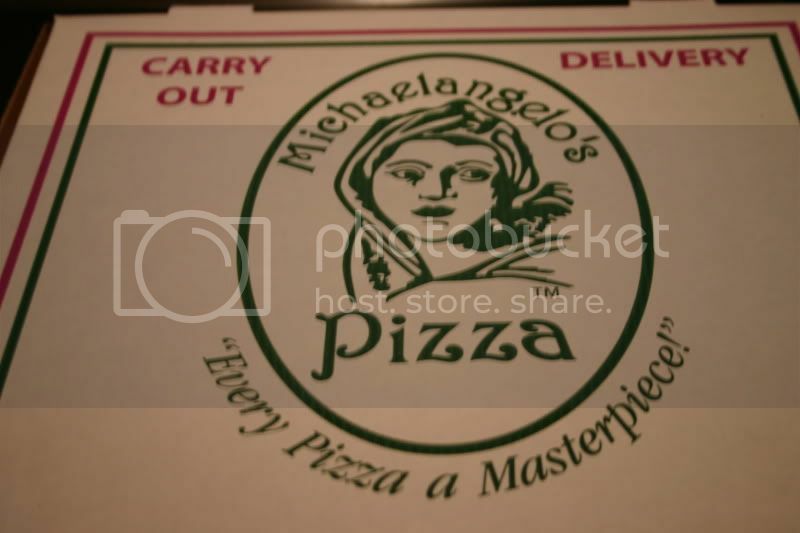 My biggest disappointment with Michaelangelo's pizza is with the sauce. The sauce lacks any character whatsoever. It is bland, and completely fades into the background. Michaelangelo's pizzas are pan pizzas, which are not usually my perference, but definitely have some redeeming qualities. I like the crispy ring that is formed around the edge of the crust. But overall, the crust has a bready consistency and lacks any degree of chewiness. As a result, their crust always seems slightly undercooked to me. I'm not sure if The Mrs has mentioned this before, but one of the best things about pizza is eating it leftover and cold the next day. In this situation, I think Michaelangelo's pan crust works well. As it cools down and perhaps slightly stales, it tightens up. And out of the refrigerator, or even at room temperature, the crust becomes almost like focaccia, with a chewier texture. The result is a kind of savory pastry that makes for a good breakfast. Austin City Limits is celebrating the 35th anniversary of the PBS series this year. 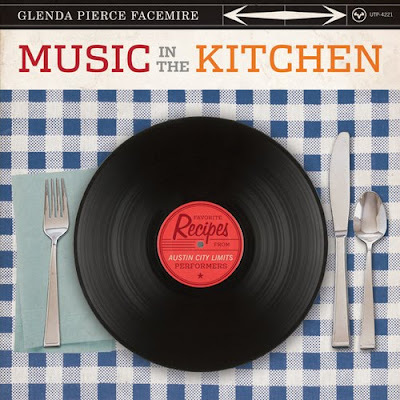 To commemorate the occasion, Glenda Pierce Facemire (the long time makeup artist for the show) is publishing a cookbook with submissions from ACL performers. You can learn the secrets to B.B. King's Classic German Chocolate Cake and My Morning Jacket's Quinoa Eggs with Cheese, Please!. There is a pretty expansive list of 130 musicians' recipes ranging from Willie Nelson to Damian Marley and even Widespread Panic offers up a Chilly recipe. It's not just barbecue sauce, Dear Reader. 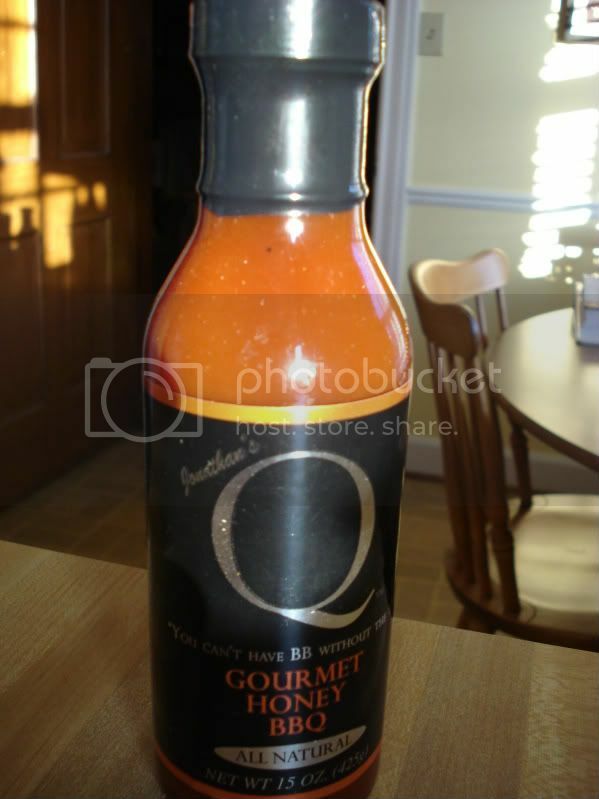 It's Gourmet barbecue sauce. Jonathan Soares started Q Products, Inc when he was but a mere college student. For a school project at Western Connecticut State University, he developed a business plan to market his mother's recipe for honey barbecue sauce. The plan sounded like such a good idea that he decided to invest his savings in getting Q Products off the ground. Since 2005, he has been pounding the pavement, spreading the Q gospel to supermarket execs. And it looks like it's paying off - his line of sauces are now featured in over 5,000 stores across the United States. Besides the original Honey flavor, there are also Spicy Cajun and Hickory Teriyaki versions of the sauce, as well as a line of "Q Fusion" marinades, all of which are all natural, with no gluten or high fructose corn syrup. The Honey sauce is about as sweet a sauce as I have tasted in these reports. Like really, really sweet. Lord knows I have no problem with sweetness, but in this case, it really is the only dimension. There is no tanginess or savoriness or heat or other interesting flavors to balance the sauce. There are traces of tomato and mustard flavor, but they are too buried in the mix to have any real bearing on the flavor. The logical conclusion to our barbecue tour of Nashville's surrounding counties would be Cheatham County, which lies directly west of Metro Nashville. However, aside from the ubiquitous Whitt's, which we have already covered, there does not appear to be a single barbecue restaurant currently operating in Cheatham County. And that's a shame, because Ashland City would be a great place for a BBQ joint - it's one of my favorite small towns in Middle Tennessee. So what we will do is sub in Dickson County, which is just a little bit further west. We begin in White Bluff with a familiar place. Carl's Perfect Pig was one of the first places we reviewed on this blog. I don't know whether my standards have escalated over the last 2 years, or if Carl's has declined, but I was not as impressed with their product this time around. The ribs were big and meaty, and were definitely finished on the grill. And they were actually cooked to a nice tenderness. But they were significantly lacking in flavor. Beyond the light application of sauce on the outside, these ribs were pretty bland. The pork sandwich was better. The meat was nicely seasoned and was complemented very well by the sauce. Overall - good flavor. The texture and tenderness were average or slightly better. This is a very serviceable barbecue sandwich, but not mind-blowing by any means. Next up, and also in White Bluff is Hog Heaven (no relation, apparently, to the Hog Heaven in Nashville). Unfortunately, the barbecue also bears little resemblance to the other Hog Heaven. What you see here is a combo plate with ribs on top and pulled pork on the right. There is also some "pulled beef" hiding under the ribs, but that's outside the scope of this report (and not worth talking about anyway). This pulled pork was very poor. It was dry, but that's not the worst part. It had a very unpleasant, almost rancid flavor that I could not take more than one bite of. I'm not sure what went wrong here. This is the worst pork that I have tasted in these reports. The ribs were not much better - dry and chewy and overwhelmed by a smoky flavor that was not pleasant. Chelsea B's is located in a Shell gas station on Highway 47, between White Bluff and Charlotte. They were sold out of ribs on the day that I visited, so I went with just a pulled pork sandwich. When I ordered, the fellow at the counter simply reached into a steam tray and removed a pre-made, pre-wrapped sandwich and told me that sauce was already on it. So it was no surprise that when I unwrapped the sandwich, I found the bun soggy and the meat mushy. The meat was lightly smoky and aided by the peppy ketchup-based sauce, but the poor texture of the sandwich was just too much to overcome. Moving on to Charlotte, Tennessee, I encountered the above sign near the intersection of Highway 47 and Highway 48. The arrow on the sign pointed to this building. There was no sign, but I knocked on the door and was greeted by an older gentleman. He took my order, then disappeared into the other side of the building, which appeared to contain an old brick pit. He returned a minute later with my ribs and pork shoulder. There was no posted menu, so I asked him how much I owed him. "Just give me ten bucks," he replied. I asked him what the place was called. He had to think about it for a second, but eventually said, "Bill's Barbecue." I guess he was Bill? I always want so badly for these kinds of hidden, off-the-beaten-path places to be great. But the reality is that sometimes they're not. Unfortunately, Bill's was not great. The ribs were dry and leathery tough. It was literally difficult to even tear away a bite. The pork shoulder was more of the same. This is about as dry as pulled pork gets. It was almost the texture of jerky. Bart's Bar-B-Que in Dickson, with their flat screen TVs and old school arcade games, is worlds away from Bill's spartan setup. Their sign contains an interesting variation on the pig-eager-to-dine-on-itself motif that we see so often on barbecue signage. Here, we also have a catfish holding a fork! Three kinds of sauce to choose from. Bart's pork sandwich is average or maybe a bit better. The pork is very tender and well seasoned, with a nice savory flavor. But there is no discernible smoke flavor and there is little textural variety (no bark). The ribs are also big on tenderness, perhaps even to the point of being overcooked. The tangy applied sauce is a nice complement, but unfortunately there is not much flavor beyond in the meat itself, smoky or otherwise. Dickson's other barbecue joint is a little place with a big reputation. Fossie's Bar-B-Que has been in operation since 1958! Milton Fossie and his brother-in-law began in the mid-50s by selling barbecued chickens as a side venture, but eventually became so popular that Fossie quit his job at the Ford Glass Plant in Nashville and opened Fossie's on Walnut Street near downtown Dickson. He operated the restaurant for over 40 years. His daughter took over in 2000 when he became ill. And it's still going strong today. Big wood pile out back. 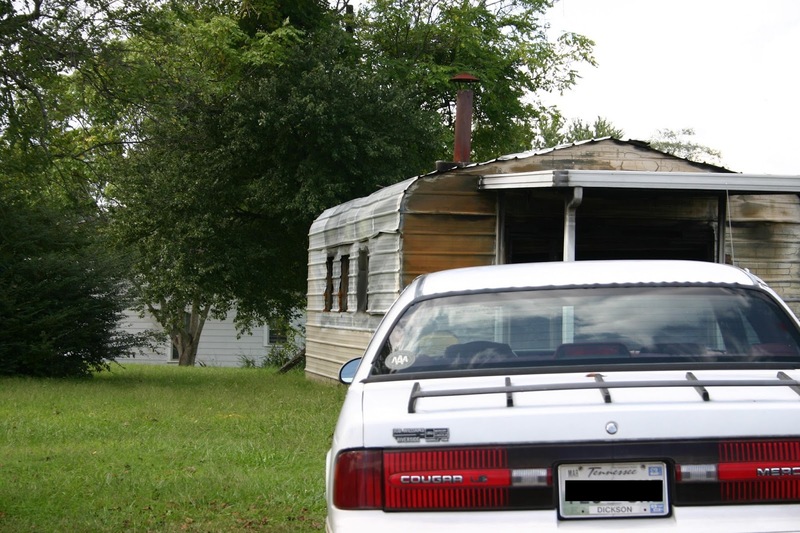 The smokehouse is in the picture at the top of this article. The pork sandwich is simple but tasty. You can taste the hickory flavor, but the sandwich is otherwise sparsely seasoned. The hot sauce is thin and vinegar-based, and complements the pork well. The meat could have been more tender, but overall, a good sandwich. Fossie's ribs are also a picture of simplicity. The outer bark of the ribs is a chewy and salty treat, with a nice pork flavor. Thanks to Muzzy on the BBQ Forum for the heads up. 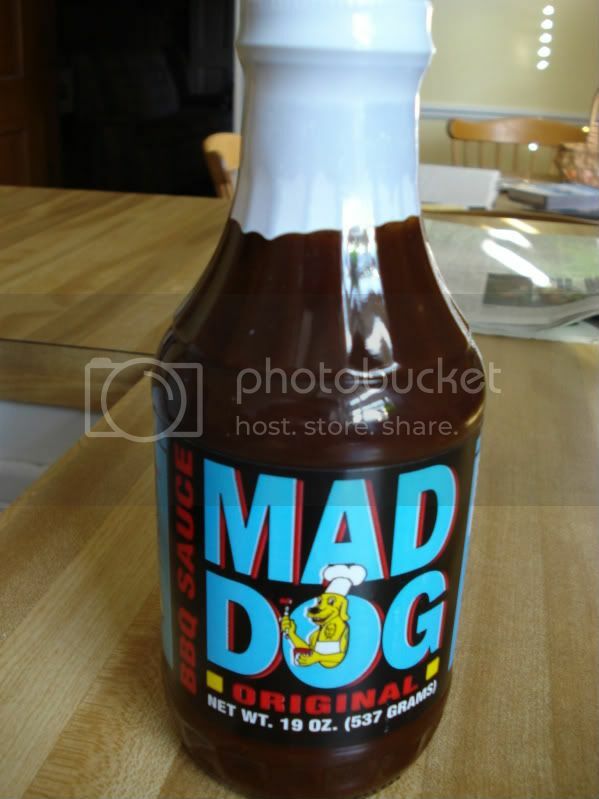 NOTE: Not to be confused with "Mad Dog" 20/20, which was a key recreational accoutrement of my teenage years. Man, that stuff was outrageous. Did you know that there is a flavor called "Electric Melon"? And one called "Purple Rain"??!!! In fact, there are a total of 17 "flavors" available - MD 20/20 is totally the Kool-Aid of adult beverages. I'm starting to think I could do a whole post on this, but I won't. Mad Dog BARBECUE SAUCE has some serious bite, especially for a sauce not specifically labeled as "hot". Make no mistake, it is quite hot. But I've come to expect it from companies who specialize in hot sauce, which Ashley Food Company certainly does. This sauce is big on high quality natural ingredients and claims no fillers, no additives and no preservatives. It also features tamari - a richer variant of traditional soy sauce, and not an ingredient you see every day. The tamari yields a strong savory element to the sauce that is complemented by the robust sweetness of molasses and some tangy vinegar. But the heat is clearly the bandleader here. It's a sneaky heat that escalates to a nice lingering burn in your tummy and on your tounge.